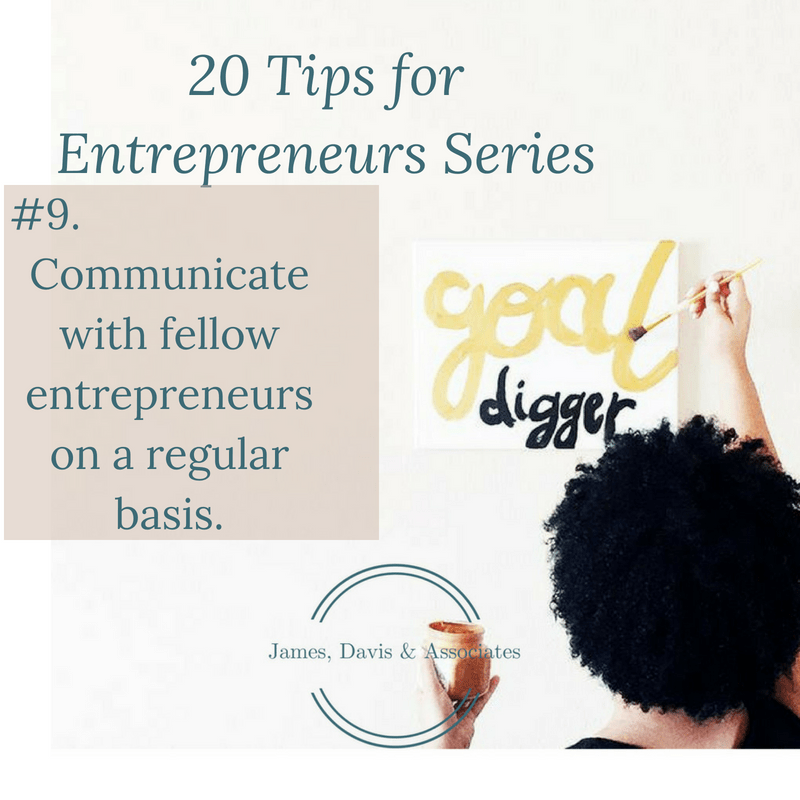 At James, Davis, and Associates we care about entrepreneurs. We believe every entrepreneur can succeed and be happy with the right encouragement, inspiration, and motivation. That is why we work each day to prepare resources designed to encourage, inspire, and motivate entrepreneurs to be their best. We provide consulting services including business planning, strategic planning, and accounting services. Check out this slide show and click on any slide to get an article designed to help you be your best. If you have questions or need help, get in touch with us by phone at: (484) 381 0532 or email us at: janeanedavis@jamesdavisandassociates.com . We would be delighted to help you be your best! JDA Tip #20 In business be old fashioned, let your word be your bond. JDA Tip #19 Obey all the relevant local, state, and federal laws. JDA Tip #18 Make sure the posts on your social media channels help your business. JDA Tip #17 Look for ways to give your employees rewards for increased productivity. JDA Tip #16 . Make sure you know every job needed in your business. JDA Tip #15 Pay employees a fair wage and expect good quality work. JDA Tip #14 Look for ways to improve customer service. JDA Tip #13 Do not dismiss customer complaints without objectively seeing if they are valid. JDA Tip #12 Clients will look for you on social media so put your best foot forward there. JDA Tip #11 Make sure your business looks inviting and not chaotic. JDA Tip #10 Never forget your business is a role model for other entrepreneurs. JDA Tip #8 Participate in career days at local middle and high schools. JDA Tip #7 Look for ways for your business to contribute to the community. JDA Tip #6 Update employee manuals to include job descriptions. JDA Tip #5 Update your technology as needed to remain productive. JDA Tip #4 ABL - Always Be Learning better ways to run your business. JDA Tip #3 Read, review, and revise your business plan on a regular basis. JDA Tip #2 Pay attention to where the money comes from for your business. JDA Tip #1 Create a plan to keep your business going if you get sick.